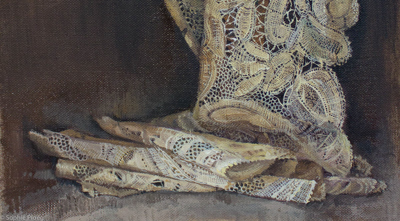 Painting drapery is a traditional subject in art school but painting lace takes it to a whole new level! Come join me in exploring the intricate patterns of lace and figure out how to tackle this in paint. We will explore patterns, layering the paint, and painting the shapes of lace drapery. We will work in acrylics as we need the quick drying time but the techniques used are coming from my experience in oils and so very applicable in oils or any other media. Not suitable for absolute beginners. Come and practice precision, patience and a steady hand! This entry was posted in Workshops Classes Lectures Symposia. Bookmark the permalink.